Lymm Golf Club’s juniors have enjoyed a fantastic season and it was celebrated in style at their junior presentation night that was attended by over 50 juniors plus their friends and family. The stars of the night were their three girls, McKenzie Gourlay, Sophie Mullarkey and Freya Jackson who were the first-ever girls team to win the Cheshire Junior Team Championship at Chester GC. This saw them qualify to represent Cheshire in the National finals at Frilford Heath where they did superbly to finish in fourth place, having been second for a large part of the day. 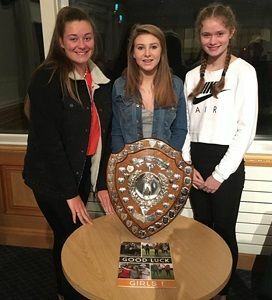 Cheshire Union of Golf Clubs handed over the Championship Shield for them to display on the night and provide great inspiration to the other juniors.